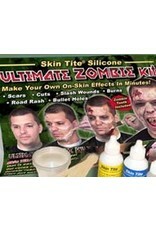 The Ultimate Zombie Kit includes everything you need to create multiple zombie makeups directly on the skin fast! 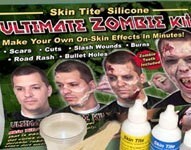 Ideal for Halloween, Zombie Walks, theatrical and movie make-up applications and more! This kit contains all the supplies needed to make simulated trauma scars, open wounds, burns, cuts, infections, and other skin FX. Skin Tite silicone can be applied directly to the skin. Cured Skin Tite is strong and will bend and flex with natural body movements. The Ultimate Zombie Kit includes: Skin Tite Silicone, Thi-Vex Thickening Agent, Silc Pig, Pigment, Rubber Glass, Mixing Sticks & Cups, Step-By-Step How-To Guide, Fake Teeth, Makeup Palette The included step-by-step DVD instructions will guide you through the process.